Our Basic Body Cream is a royal treatment for all skin types. It has a soft and fluffy texture that makes it irresistible. It absorbs quickly and completely without leaving a greasy residue. 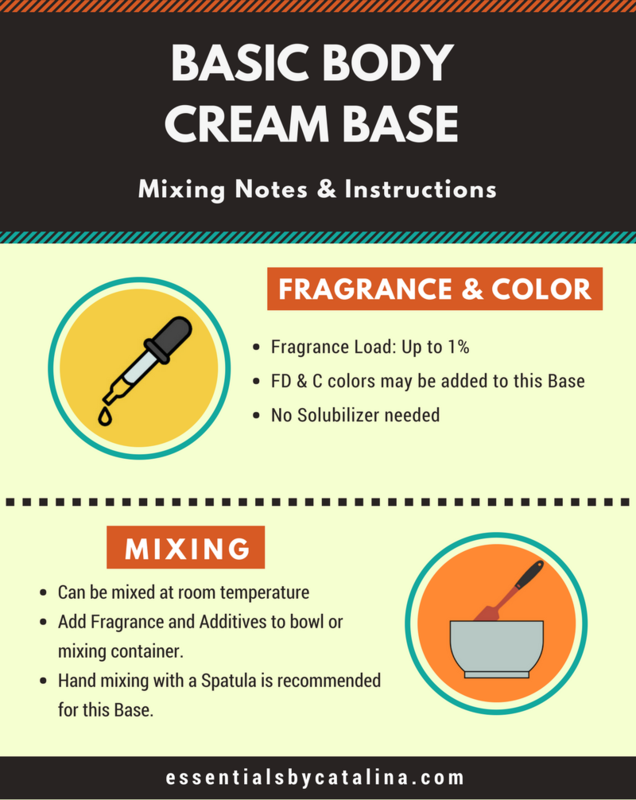 Presenting our Basic Body Cream Base! This rich, creamy base is actually one of our oldest formulas, but it was time for a little makeover. While Parabens have been used as an effective preservative for decades, our constantly evolving industry has been moving away from them due to the availability of so many new, innovative alternatives. We too, have decided to phase out Parabens and give the base a makeover, removing Triethanolamine while we were at it. 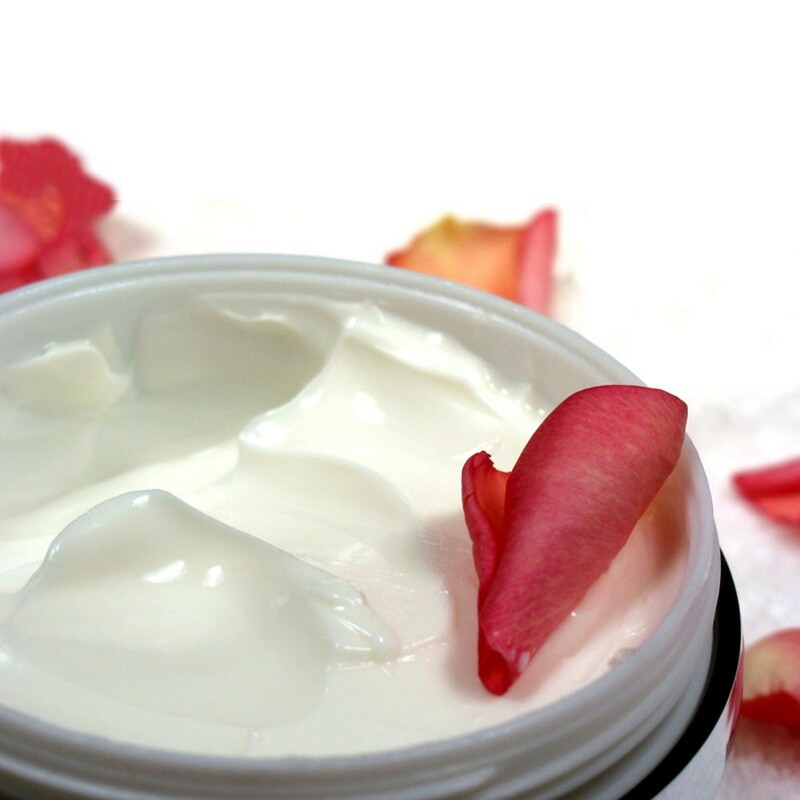 The Basic Body Cream is easy to customize with additives such as Shea, Mango and Cocoa Butter. What used to be our “Whipped Body Frosting” is now our Basic Body Cream Base. It still remains Unscented and 100% Ultra White meaning you will use less fragrance to scent your product, saving you money in the process! Vibrant colors and pastels are also much easier to achieve. It contains the minimum amount of preservative needed to effectively protect the product. Our Basic Body Cream Base is packaged in a open top pail which allows you to scoop out every last bit of this great product. We wanted a product that was different from the traditional Body Cream. Customers were asking for a lighter, non-greasy feeling Cream that still provided the deep, long lasting moisturizing our skin needs. Our lab was able to create a product that far exceeded all expectations. Our Basic Body Cream Base is a royal treatment for all skin types. It has a soft and fluffy texture that makes it irresistible and absorbs quickly and completely into the skin without leaving a greasy residue. Many describe it as rich and luxurious..
Others described it as a frosting, rather than a cream that felt smooth, whipped, and thick. Some said they even wanted to eat it! * However, they all agreed that it feels fabulous on the skin. "The Basic Body Cream Base feels like an invisible layer of moisture on the skin, as though it were a velvet glove." Those who have tried it love it! We are confident that not only will you enjoy it, but so will your customers. Our Basic Body Cream Base is a wonderful addition to any product line. Add it to yours today! *All though it may look good enough too eat, Essentials by Catalina advises you not to do so, we already tried and it's not good (just kidding). Our whipped body frosting is not for consumption. I really wish I had found this Lotion Base sooner. I have tried SEVERAL unscented lotion bases from various well-known companies, but they all were only sub-par. The unscented bases would either thin out too much after adding oils, or they'd leave you feeling sticky/greasy, or they'd have that strong base scent that was difficult to mask. All unscented lotion bases do have a "base scent" and some are so strong that it morphs the scent of the fragrance oil, making the lotion smell off. Finally, I found the perfect base lotion.. the Basic Body Cream here at EBC! The consistency is fabulous, not too thick, but definitely not thin. Creamy and somewhat fluffy, rubs in easily and doesn't leave your skin feeling sticky/greasy. Even better, it maintains it's wonderful consistency after adding fragrance oil. Perfect lotion for both jars or squeeze bottles. It has the lightest base scent I've encountered and is easily masked by fragrance oils, which is super important to me. I also like that it comes in pails, making it easy to get every last bit of the lotion out. And just when you think it can't get any better, this vegan base is paraben, cruelty, gluten, soy, and sulfate free. Hope EBC never stops selling this, they really do have a gem of a lotion base on their hands. This is the best lotion ever! I love this lotion! I add some shea butter to mine with fragrance. Skin stays smooth and moisturized all day & night! If there is was a "hell ya" button on whether I would recommend this I would check that box! Amazing quality! Living in the hot, humid South, this performs amazingly well. Rich and creamy, great glide-on, absorbs immediately with a soft, silky after-feel...not the least bit tacky or greasy! Added 3% Argan oil and 1% Lavender E/O, which incorporated easily...I will be using this as a multi-base cream that I can custom create creams depending on their needs. Can't Be without this stuff!!! This is a MUST HAVE for psoriasis, eczema and other skin issues of severe dryness. I sell to doctors and nurses who tell their patients and all return for more because it works. No greasy residue and only needs to be applied once to twice daily. It has literally worked miracles on hopeless skin. Thanks EBC...it's AMAZING! The Basic Body Cream Base is PERFECT. It goes on smooth and last all day. Your skin stays moist after taking a shower. My only complaint is that is very hard to get the product out, I wish it came in a pail format. I purchased this product not knowing what to expect and I just love it. I was very septical about purchasing this because all the other moisturizing bases that i've purchased from other vendors all left either a greasy feel afterwards or were too watery that they don't moisturize my skin for a long period of time. But when I tried this stuff, I was blown away! I love the velvet like feel it gives when you put it on and it does not leave my skin greasy at all. My customers rave about this product so I will definitely be buying more in the future. Amazing product, this body butter is thick, creamy and super moisturizing with out being greasy. I love it unscented, but it also is fantastic scented (lavender is great). I ordered it to package up and sell and give as gifts, I might have to keep half for myself. I am totally addicted to this product. I purchased it in Lavender Vanilla. I originally bought it for customers, but I had to order more because I used almost all of it. Love it!